(From left) N.E.W. Piano Guys Peter Hernet and Dan Rafferty during a recent performance. Submitted. Dan Rafferty and Peter Hernet knew they were ready to start their own business as the N.E.W. Piano Guys, but weren’t sure if Northeast Wisconsin felt the same way. So far, the public reaction has been far beyond anything they could have imagined. Since officially beginning in July, the N.E.W. Piano Guys have been in demand all across the state, and Door County will have its first opportunity to see them perform at CHOP in Sister Bay for a New Year’s Eve celebration. 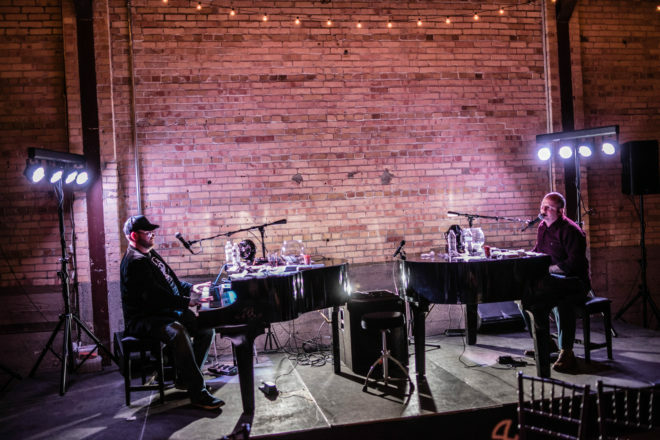 When they first started working together, Rafferty and Hernet were travelling all over Wisconsin for their dueling piano gigs. Rafferty would pick up Hernet in Oshkosh, and while driving these long stretches, they began to imagine a different version of their careers. “We had the ‘wouldn’t it be great’ conversation’” Rafferty said. At the time, Rafferty was working in IT while moonlighting as a dueling pianist. Combined with Hernet’s experience as a seasoned career musician, Rafferty realized, “It was kind of a perfect match when it came to our respective backgrounds.” Whereas Rafferty excels in making business contacts and setting up gigs for the group, Hernet knows the ins and outs of the dueling industry and understands the venues and events where the group will be most successful. Hernet knew there were only a handful of dueling pianists that could do what they did, and wondered if it would be possible to cut down on the travel and localize their business. “Dan and I were seeing other organizations coming in from the area, people in Michigan, Ohio, Chicago. It was bigger city dueling piano groups that were charging bigger city prices. So we saw a need for more of a local dueling piano company that could thrive up here,” Hernet said. After setting up their website and preparing marketing material in their first months of inception, the N.E.W. Piano Guys started to hit the ground running and began scheduling gigs in late September. But they had no idea just how much interest their new venture would garner. “I expected this to be received well, but I did not expect it to be received as well as it has,” Rafferty said. Due to the adaptable nature of their act (they can play background music, play any song imaginable or perform their dueling piano act), the N.E.W. Piano Guys have attracted interest from places that even they hadn’t anticipated. Wedding planners, businesses, and a televised charity telethon event are taking meetings and reserving Rafferty and Hernet’s services, knowing the kind of skill and entertainment their act can bring. “We’re basically a human jukebox,” Rafferty added. The emergence of the N.E.W. Piano Guys coincided perfectly with the opening of CHOP’s new full-space cocktail bar, which will be used as an evening entertainment venue. Jody and Patsy Wuollett, owners of CHOP, a steak and seafood restaurant in Sister Bay, had always wanted to open a space like this, something they felt the town did not yet have. The Wuolletts also hope to offer up the space to organizations in Sister Bay that struggle to find a meeting place. After being tipped off by their guests to the N.E.W. Piano Guys, they met each other and decided the group would be the perfect act to break in the new, intimate venue. The upcoming performance is a trial run of sorts for both CHOP and the N.E.W Piano Guys. If the collaboration is successful, both parties hope to establish a regular performance schedule during the peak summer months. By the time the N.E.W. Piano Guys perform for CHOP’s New Year’s Eve celebration, they will have only been in business for a short five months. But everything has changed for Rafferty and Hernet since those fateful conversations during those long car rides, about their “wouldn’t it be great” lives. Now they are living those lives, playing music and doing what they love while serving Wisconsin communities. If you don’t have New Year’s plans, come to CHOP at 9 pm on Sunday and enjoy the entertainment and the beautiful new space. And be sure to get a couple of your favorite songs stuck in your head before you come – the N.E.W. Piano Guys will be sure to know it.